Be prepared for the weather with our rain poncho in ball keychain. Poncho folds to fit in 4" round case with plastic keychain clip. 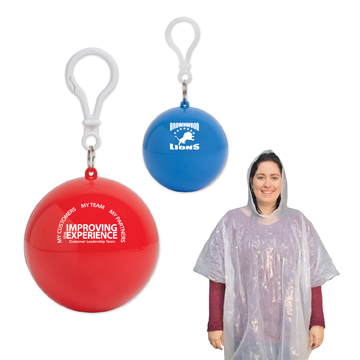 Add your logo to the ball case and have your logo stand out whenever the weather strikes! Available in blue (S21069X) and red (S21070X). Imprint Size : 1 1/2" x 3/4"